What is the the weather at the top of Haleakala? The temperature at the summit of Haleakala often dips into the 40s and sometimes cooler. Though most of Maui is nearly always warm tropical weather, the top of the summit is nearly always cooler. The National Park Service suggests temps at the summit will be 30 degrees Fahrenheit (17 degrees Celsius) cooler than coastal regions of Maui. I think it’s often even more of difference when compared to Lahaina and other areas of West Maui. Maui performance road bike rentals by Specialized at West Maui Cycles in Lahaina. As the day warms and island heats, the 10,000 feet peak summit of Haleakala tends to accumulate clouds from the passing trade winds on most days of the year. Because some of those clouds often contain moisture, on all but the clearest of days you'll want to be heading down the mountain before noon. A West Maui Cycles bike mechanic noted the summit of Haleakala is only clear in the afternoon about 20 days of the year. The mountain can be deceptive. Though the summit may look clear from South Maui locations such as Kihei and Wailea or sometimes even from Kahului in central Maui, don't be fooled into getting your bike ride off to a late start. While Haleakala may look like it is clear on an afternoon, it is very rare for the mountain to be completely clear and weather pleasant for bike riding top to bottom late in the day. Haleakala is often 100 percent different weather conditions than Kaanapali and other West Maui areas. 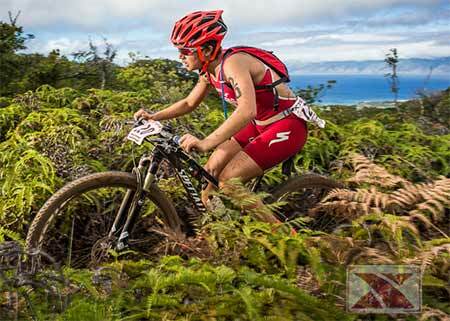 XTerra world championship bike riding on Maui. Use the 7 day NOAA weather forecast for the Haleakala Summit. Or, check the University of Hawaii Institute of Astronomy for weather and webcams from the crater. What is the best time of day for a Haleakala bike ride? Due to the likelihood of encountering less than ideal weather, we recommend being at the summit as early as possible. If mountain biking down or riding a cruiser down Haleakala, get started with the sunrise for the best chance of getting back down the mountain while the weather is clear. If you are riding up the mountain, you’ll want to as early as you can so you reach the summit early and have a little time to recover and explore the top before heading back down the mountain. For an early ride up Haleakala, when should I rent my bike from West Maui Cycles? To ensure you’ll reach the summit early before less than ideal weather arrives later in the day, you’ll want to rent your bike the afternoon or day before you plan on riding. Our bike shop opens at 9 am and we close at 5 pm, Monday through Saturday. On Sundays, we open at 10 and close at 4 pm. Please allow at least 15 to 30 minutes to process your bike rental and make any last minute bike adjustments for you. With a couple hour (or longer if cycling) driving distance between the West Maui Cycles bike shop and starting points, it is a must to rent a bicycle the day before cycycling on Haleakala. During winter months on Maui, the sun rises just before 7 am in early January. As spring arrives, the sun rises a little earlier with daylight just before 6 am toward the middle of April. By the middle of June the sun will be rising just after 5:30 am, earliest for Maui. Days begin getting shorter and sunrises on Haleakala later, usually just after 6 am in September. The XTerra World Championships on Maui begin early with the sun rising about 6:20 am in late October. By Thanksgiving, the sun is rising around 6:40 am. During the holidays in late December, riders should expect Maui sunrise times between 6:45 and 7 am. Some information about Maui Sunset and Sunrise Times was derived from The Bishop Museum in Honolulu. We recommend renting your bike the afternoon (or day) before you plan on riding Haleakala to ensure you'll get an early start. Depending on the time of year and what time the sun is rising, you may want to leave South Maui or West Maui as early as 2 or 3 am if you wish to get to the top in time to watch the sunrise from the summit of Haleakala. With vast assortments of differing geography available for bike riding on Maui and at least 17 unique microclimates are found around the island the weather on one part of the island may be completely different than another part. From rain forest conditions of east Maui or the cooler slopes of Haleakala to the hot tropical weather of the south and west Maui coastal areas, you can be certain of finding weather favorable to bike riding. Maui offers unparalleled bike riding opportunities for riding in almost any kind of weather. It is not uncommon to hear locals say "If you don’t like the weather where you are, move 15 minutes in either direction and the weather will be different". Haleakala means house of the sun. Explore the Haleakala National Park Service website. Park entrance fee is $5. for cyclists and cars are $10. for 3 day pass to the park. Take a look at the mountain bike trails map for Haleakala. and other mountain bike riding on Maui. Use the comments section below to ask questions about biking on Maui or cycling on Haleakala. Ready to reserve a bike rental on Maui? Its easy. Hit the button below; pick a rental bicycle and supply a little information including the dates you want to rent the bike; complete the reservation and your bike will be here waiting for pick up at the bike shop in Lahaina, West Maui Cycles.